"The bolts fell like a shower of stars, scything through the duergar raiders with lethal accuracy. The War of Reclamation had begun, and we led the way in a rain of glory." In the tradition of the soulknife, a soulbow realizes the direct capacity of her own mind to give shape to weapons of psionic perfection. Through desire alone, a soulbow creates a semisolid blade composed of psychic energy, just as any soulknife can. Unlike a soulknife, however, a soulbow can also produce dazzling shafts of deadly grace that she can project with all the force of a composite longbow -- using nothing but her mind. The soulbow relishes her ability to attack foes at a distance. Accuracy, speed, distance, and lethality are all skills a soulbow pursues and perfects -- and in so doing, discovers serenity in lethal mastery. Any character with a desire to become a master of mental archery might be drawn to train as a soulbow. In practice, however, becoming a soulbow requires a character to take at least two levels of the soulknife class to gain the throw mind blade prerequisite. Special: Throw mind blade class feature. Class Skills (4 + Int modifier per level): Autohypnosis, Climb, Concentration, Craft, Hide, Jump, Knowledge (psionics), Listen, Move Silently, Profession, Spot, Tumble. All the following are class features of the soulbow. The abilities described here turn a soulknife into someone who is proficient at ranged combat using a manifestation of the mind blade more akin to an arrow. In addition to that, the class generously hands out bonus feats ideal for making ranged attacks, and grants a few class-specific abilities. *These abilities are described in Expanded Psionics Handbook beginning on page 165. All other ranged weapon special abilities are described in the Dungeon Master's Guide. Phase Arrow (Ps): At 8th level, you can take a full attack action (in lieu of your regular attacks) to expend your psionic focus and launch a mind arrow at a target known to you within range. The mind arrow travels to the target in a straight path, passing through any nonmagical or nonpsionic barrier or wall on its way. (A wall of force, wall of fire, wall of ectoplasm, or the like stops a mind arrow.) This ability negates cover, concealment, and even armor modifiers, but otherwise the attack is rolled normally. As a soulbow, you have learned to turn your mind blade into a deadly arrow of psychic energy, striking swiftly and with legendary accuracy. However, you don't require the base materials of either bow or wooden arrow -- your mind is the bow, and it provides the psychic ammunition in endless quantity. With the power of your mind, you can pierce your enemies at will. Other soulknives look upon your specialization with some envy, and might even ask you to train them in your methods. The ability to produce both a mind blade and a mind arrow is yours; however, you have decided to forego further development of your mind blade to concentrate your mental resources on psychic archery. This is the same promise you extract from other soulknives before helping them find the mental key necessary to produce mind arrows of their own. It isn't surprising that as a ranged attack specialist, you should consider positioning yourself away from the direct threat of melee, at least until you have gained your close combat shot ability. Still, you have the ability to damage your enemies from a distance, so you should take advantage of it as much as possible to preserve your health. Stay clear of melee combat and pepper your foes with mind arrows from a safe distance. Because you have the ability to swap out the ranged special ability of your mind arrow, intelligence regarding possible foes is very valuable to you. If you can learn that you'll likely be up against giants in the next little while, for example, spend 8 hours (if you can) changing the special abilities of the mind arrows you create to resonate with the giant bane quality. Taken in by the power of your own psyche, you trained as a soulknife and quickly learned the art of producing a mind blade. Not satisfied with that accomplishment, you learned how to project mind arrows. While some soulbows learn the key to producing mind arrows through unflagging study on their own, most learn after getting training from a group called the Reclaimers. The Reclaimers are a secretive organization that seeks out those with the ability to manifest a mind blade and offers them training. In return, the group lays some claim to the newly trained soulbow's affiliations. The Reclaimers take a dim view of self-trained soulbows who have no ties to their organization. As you advance in your training, one of the first feats you take should be Precise Shot, which offsets your penalty for firing mind arrows into melee. Rapid Shot should also be high on your list -- the more shots you make in a round, the greater the chance you'll score a strike. As far as skills go, continue to buy ranks in Move Silently, since this skill is important for getting into a good position from which to launch your mind arrow volleys. Concentration is also an important skill for you -- having a high Concentration modifier means you'll be better able to regain your psionic focus. As a soulbow, you can expect resources according to your persuasive ability, like any other character. If you represent yourself as a Reclaimer, however, you can expect aid from commoners and downtrodden in the form of a place to sleep, simple fare shared with a family, and -- from particularly brave souls -- a place to hide from authorities (should you require it). 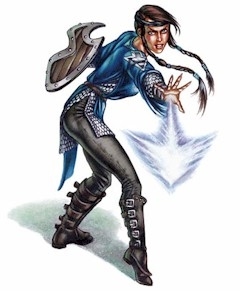 Reclaimers wear an amulet or shoulder patch featuring a silvery astral arrow. Authority figures of various cities, city-states, and countries are beginning to take a dim view of the Reclaimers and the soulbows and regular archers who make up the group's membership. If you are identified as a Reclaimer by an official of a particular city, even basic services might be denied to you. Reclaimers who wear their symbol openly also have taken to wearing a black bandanna or mask at the same time, so that once they finish a particular mission, they can remove mask and symbol to return to anonymity. "When you see the silvery arrow on a masked man's shoulders in the street, you'd best hit the dirt. There's about to be a fight, and sooner or later the city watch will arrive, hell-bent on taking the soulbow down." A lone soulbow is like any other adventurer -- someone with above-average abilities seeking to make her own way in the world, seeking fortune, fulfillment of quests, and the serenity that accompanies an adventure concluded. Few soulbows go through an entire career, however, without being approached by a recruiter from the secretive organization known as the Reclaimers. Soulbows are free to join any organization, but the organization that is most closely associated with the prestige class is the Order of Reclamation, more commonly referred to as the Reclaimers. The Reclaimers are devoted to ending tyranny in all its forms. The organization accepts commissions from supplicants it finds worthy, but also launches its own interventions on occasion. Joining the Order: The Reclaimers accept soulknives who meet the minimum requirements of the soulbow prestige class (because these soulknives can be trained as soulbows), soulbows, and archers who use physical bows and arrows but can demonstrate supernatural, psionic, or magical prowess with their bows. Benefits: The main benefit a PC can expect from being a member of the Reclaimers is the knowledge that he or she will continue to be trained in the soulbow class. At least as important to some characters is the feeling that they are fighting the good fight; such characters revel in the idea that they are agents working against oppression. Headquarters: Because of the underground nature of the Reclaimers, the location of the order's headquarters, the identity of its top members, and the structure the defines the group are well-kept secrets. In fact, the group has a central location out of which it operates -- a fortress located in an uncivilized waste. Three ancient psionic portals allow the Reclaimers (in their Fortress of Reclamation) to rapidly move to and from three important cities around the world. From those cities, they can mount missions or activate soulbow Reclaimers who are otherwise engaged. Missions: Itinerant Reclaimers (as the majority of soulbows tend to be who are part of the group in the first place -- including player characters) usually discover their next mission in the form of a message engraved on a wooden arrow delivered in a cloth-wrapped parcel from some unknown source. Except in extraordinary cases, only a single itinerant soulbow is activated for each particular mission, according to the character's ability and proximity to a given problem. It is up to the activated soulbow to gather what resources she believes are necessary to get the job done. This might mean finding hirelings, or asking for the help of other PCs. Sample missions might include freeing a wrongfully accused prisoner from a king's dungeon, breaking the iron grip of a group of half-orc racketeers down on the docks, or infiltrating a temple that is suspected of hiding an unsavory, evil secret. An itinerant Reclaimer is activated at most two or three times during her career, unless she requests more missions.